;; Additional definitions by Pierpaolo Bernardi. 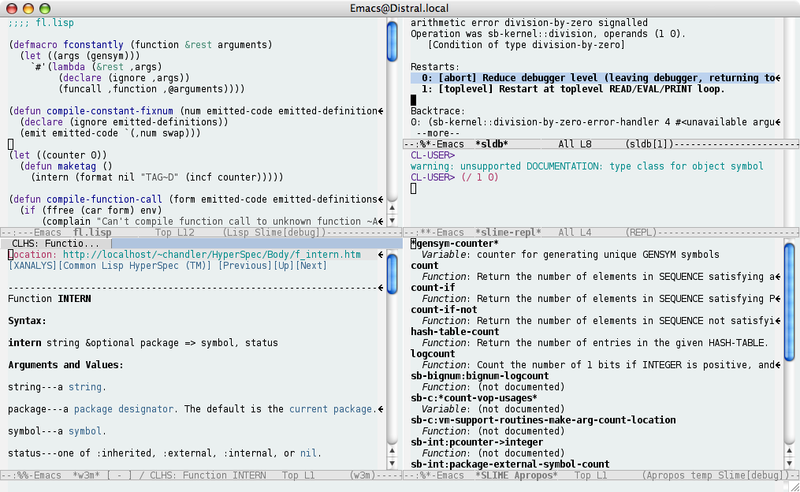 SLIME: The Superior Lisp Interaction Mode for Emacs (minor-mode). C-c RET - Macroexpand once. C-c M-m - Macroexpand all. C-c C-w c - WHO-CALLS a function. C-c C-w r - WHO-REFERENCES a global variable. C-c C-w s - WHO-SETS a global variable. C-c C-w b - WHO-BINDS a global variable. C-c C-w m - WHO-MACROEXPANDS a macro.